Starring Dennis Quaid, KJ Apa, Juliet Rylance, Peggy Lipton, Britt Robertson, John Oritz, Kirby Howell-Baptiste, Pooch Hall, and the voice of Josh Gad. I know, it’s another one that’s not my typical kind of movie. Well, it was recently Family Day here in the province of Alberta, and I celebrated with my sister and her family. My nieces got to pick the movie, so of course they picked the one with the cute puppies. 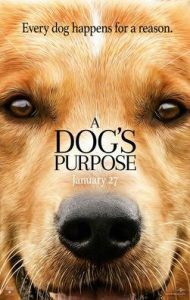 So I was off to learn what A Dog’s Purpose is. Our hero is a dog named Bailey. Bailey gets reincarnated several times throughout the film, and through it all, ponders the meaning of life. In his first life, he’s fast friends and companions with a boy named Ethan. Ethan grows up to be quite the popular young man, a football star with a bright future, but then a twist of fate takes it all away from him. In his next life, Bailey becomes Ellie, a police dog learning to serve and protect on the streets of Chicago. From there, Bailey is reborn as Tino, a Corgi who helps his owner find love and happiness. And then, as Buddy, Bailey is able to use all the skills he’s picked up in his lives to help out those who have helped him, and truly discover what a dog’s purpose is. Cute dogs! Pretty good acting all around, too. Funny in some parts, and actually kind of uplifting. Well, “boy and his dog” stories are about as cliched as superhero stories at this point, so the formula gets a good workout. Nice family entertainment, but bring a hanky.